We’re experiencing Fonzie-like weather right now—cool, but not harshly cold. Cool enough to change the song on a jukebox with the snap of a finger, but still warm enough to take full responsibility when it burns down Arnold’s diner. (Okay, suppressing my desire now to make this whole thing a Happy Days reference.) What I’m trying to say is that I can’t comfortably do full hive inspections because it’s still topping out in the 40s. But on sunny days this week my colonies were bringing in a lot of pollen, presumably from blooming maple trees. That new-found abundance of pollen makes me worry that some of the stronger colonies could already be thinking about swarming. So before their scout bees settle on a tree cavity, I went ahead and put out a couple swarm traps a few weeks early. I’ve already seen bees sizing them up, so I’m glad I hung them few weeks earlier than normal this year. The downside to putting them out early is that the empty hives tend to attract other bugs, so they may not be pristinely clean during prime swarm season in May; I’m counting on the bees being mostly undeterred by a woodroach or two. Putting them out early also bears a small financial cost, because every week or two I’ll spray a little Swarm Commander into the entrances—not a huge cost, but it may double my yearly expense for swarm trap bait. I’ve posted before about how I build swarm traps. I’ve had good success with these, saving me a few lost colonies. I’ve also seen at least one swarm ignore these traps and fly into the woods never to be seen by me again…breaking my heart the way Fonzie did to so many ladies in poodle skirts. How many cords of firewood would bees need to survive the winter? This sounds like a dumb question because it is a dumb question. I’m going to ask it anyway because I’m curious. Kevin Inglin recently discussed the British thermal units (BTUs) available in honey on his podcast, and it got me thinking about the a colony’s winter honey burn in comparison to my own winter firewood usage. Kevin mentioned 4,400 BTUs per pound of honey—I couldn’t find a source for that number, so I had to use a different one. According to the USDA, honey has 304 calories per 100 grams. There are 454 grams in a pound, so this equates to 1,380 calories per pound of honey. Converting calories to BTUs reveals there are 5476 BTUs of stored energy in each pound of honey. Meanwhile, the white oak I predominantly burn in my woodstove has an available heat value of about 6,930 BTUs per pound, according the figures on this University of Illinois Extension table. Honey bees might go through about 40-50 pounds of honey in a winter; the honey provides nutrition to individual bees, for sure, but it’s also the fuel for generating heat to keep the cluster from freezing in cold weather. The exact amount of honey needed to overwinter is arguable and highly variable, but most beekeepers in northern climates try to have at least 40-50 pounds of honey on each hive going into the winter. So let’s use 45 pounds as a colony’s winter honey consumption. There are 246,420 BTUs in those 45 pounds of honey—about the same stored energy as 36 pounds of my firewood. (For context, the picture above shows 36 pounds of firewood.) At 4,200 pounds of seasoned white oak per cord, the bees are surviving on 0.8% of a cord each winter. So it would take 117 colonies to burn through the equivalent of a single cord of firewood. Sounds pretty efficient considering I go through a few cords each winter myself. But which of us is really making the best use of our heating energy? Well, if an overwintering honey bee colony weights 10 pounds and burns the equivalent of 36 pounds of white oak, it’s using 3.6 pounds of cordwood per pound of colony. Meanwhile, my combined household weight is around 280 pounds, and we’re burning through 12,600 pounds of white oak, thereby using 45 pounds of cordwood per pound of family members. So the bees are 1250% more efficient with their heating than I am, and that’s not even taking into account that my body is generating its heat from food, independent of the firewood I use to warm my home. So why does this matter? It doesn’t really. But it’s still fun knowing. As I drove north through California last week, I witnessed the most symbiotic relationship in modern agriculture—white bee hives peppering the green-and-brown almond groves that have taken over the Central Valley. Thousands of hives had already been moved into the almonds, perhaps some of them overwintering there, and thousands more will follow. This migration is in anticipation of California’s massive almond bloom in late February. I’m not sure how well this is known outside of almond an beekeeping circles, but each almond you pop into your mouth has likely been midwifed by a honey bee. Almond growers need about two colonies of bees for each of their one million acres, so beekeepers need to have two million hives in the Central Valley for the February through March bloom period. That’s about 3/4 of the total honey bee population in the United States. Let that sink in—right now a vast majority of America’s honey bees are in the almond groves. It seems the easy thing would be to set up massive apiaries in almond country and keep bees there year-round. But driving through the area it’s clear why this won’t work—there are, ironically, too many almonds. During the 11 months of the year when there are no blossoms on the almond trees, the bees would go hungry. It’s the same reason the almonds can’t be pollinated by native species—their populations are nowhere close to adequate to touch each flower. It’s a sad side effect of monoculture at this huge scale, and I suspect it leads to a dearth of forage and habitat for all types of animals, not just honey bees. But it’s the reality we’ve created, so commercial beekeepers truck in their hives year after year to satisfy humanity’s swollen demand for almonds. The going rate for a hive is probably north of $190 this year, or about $380 million for the entire pollination. Believe it or not, this is more than the $320 million US beekeepers make selling honey (mostly due to depressed prices caused by China flooding the world with cheap “honey”). That’s a big incentive to pack up your hives and send them west. How do almond growers afford this? Well, at current market rates of $3 per pound, their combined annual revenue is over $5 billion. So the cost of pollination—while it’s been climbing—isn’t sending growers to the poor house. This co-dependence comes with great risk. The difficulty we’ve had keeping bees alive over the last decade has no doubt struck fear into the hearts of almond growers. It’s no surprise, given the stakes, that a lot of money has been thrown at helping “save the bees” from pests like varroa mites. A multi-billion dollar industry needs bees to support its production. But it works both ways. Big beekeepers are so dependent on payments from almond pollination that a disruption would remove much of their incentive to keep so many colonies—or even their ability to stay in business at all. The near-term outlook is pretty good for both US almond growers and beekeepers, but with our almonds concentrated in a single area, the industry seems vulnerable to things like disease, climate change, and natural disasters. It’s also easy to imagine another country might have its own plans to reduce the world’s reliance on California almonds (looking at you again, China). For now, commercial beekeepers can count on big checks from pollination, and almond growers can count on even bigger checks from food processors and exporters. But there could be a shake-up coming in our lifetimes (did I mention many of the almond trees now being planted are self-pollinating?). This could ultimately lead to a drastic decline in our honey bee population, similar to what happened after World War II when the government stopped subsidizing beekeepers. I haven’t decided yet if this would be a good or bad thing…while I’m not a huge fan of large-scale commercial beekeeping, the demise of those operations would greatly reduce money for things like honey bee advocacy, habitat preservation, scientific research, and development of bee-related products. Arguably, it could also improve the health of what would remain of the bee population by putting an end to the mass migration into a concentrated area each year, where pests and diseases are shared between colonies that would otherwise never be in contact. In the meantime, I’ll try to keep my homegrown line of bees healthy and happy, my tiny little bit of land pollinator-friendly, and my honey flowing. One of the fun things about being a beekeeper in a northern climate is the annual winter recess. It’s an opportunity to relax a little, evaluate last year’s mistakes and successes, plan the next year, and make stuff. And there are plenty of things to make. Hives, hive stands, fondant, and bee club presentations are all things I end up spending at least a little time on each winter. But the most fun winter project for me is making candles. I get all my capping wax cleaned and melted into blocks in the summertime using a homemade solar melter; that means I can spend a pleasant weekend each winter transforming that clean material into candles—an underrated product of the hive, if you ask me. Below is a basic how-to for making candles out your beeswax, with links to some of the items you’ll need. Before you get started, I highly recommend you watch this great video by Booger Hill Bee Company. He does a first-rate job explaining his process. Step 3: Put a couple short blasts of mold release spray into your mold. Step 4: Put a rubber band around the top of your mold (which is really the bottom of the candle). These molds have slits that allow you to remove the candle after it’s cooled, so the rubber band ensures these slits are closed tightly and evenly. Step 5: Pour your melted wax into the mold, filling it to the top. The wax may shrink a bit as it cools, resulting in a “pothole” at the top of the mold. I typically come back and fill this hole with more wax to make sure I don’t have hollow bases on my candles. Step 6: Remove the candle from the mold. Once your candle is completely cooled (I go away and do other things, and then come back in about an hour), remove the rubber band. Pull the mold apart at the splits, grab the wick at the top of the mold (bottom of the candle) and firmly pull it straight out. Step 7: Reset for the next candle. When you pull the candle from the mold in Step 6, you’ll also pull a new section of wick through the mold (this is great, because you don’t have to use the wire to thread wick for each candle). Use scissors to cut the wick so there’s 1/2 inch sticking out the top of the candle. Carefully pull the bobby pin out of the finished candle and attach it to the new section of wick. Then simply repeat the process starting at Step 3! I find these colonial tapers to be perfect for home use, as they throw good light and burn for about 10 hours. Plus, in my opinion, they have a traditional, classy aesthetic that can’t be matched by tea lights, animal molds, etc. Each candle uses less than 3 oz of wax, so even hobby beekeepers have enough wax most years to make candles for gifts, emergency lighting, table settings, or to burn on cold winter nights while they’re planning the next beekeeping season. I’ve taken some heat about the way I winterize my honey bee hives. Specifically, there are people who can’t fathom why I’d intentionally put vents above the nest. And frankly I understand why they’d be skeptical, because on the surface it doesn’t make sense to encourage air flow in a hive you’re trying to keep warm. But it starts to make more sense when you factor in moisture. I’ve said it before and I’ll say it again: a colony is pretty adept at surviving the cold, but horrible at surviving the cold when wet. If you’ve ever been camping in the fall and woken up early in the morning with condensation inside your tent and sleeping bag, you can relate. The picture above shows the inside of an inner cover absolutely saturated with water. I found this—and several others—inside hives I’ve been winterizing over the last week. What causes this water build-up? First, the bees eat honey for the energy they need to generate heat. Some of the water in the honey gets breathed back into the surrounding air. Then the relatively warm air around the bees carries the water vapor up to the top of the hive. The humid warm air hits the top of the hive, which is cold from the outside air. This is a recipe for condensation…warm moist air contacting a cold surface. The danger of this condensation is that—like the ceiling of a tent—it’ll start dripping down on the winter cluster of bees. The bees that get hit don’t stand much chance to survive, and over time these losses could shrink the cluster to the point it can’t withstand the cold anymore. To combat this cycle of wetness, I make a “winter sandwich” on top of my hives. The picture below shows a vented super above my hive bodies. I'll plug and open the vent holes throughout the winter to try and manage the temperature and moisture inside the hives. Of the eight vents, I almost always keep seven of them plugged with rubber stoppers. The eighth vent I leave open on front of the hive—this is to discourage any air flow from crossing over the cluster while still venting moist air before it can condense. The vented super also gives me space to put fondant for for winter feeding. Above the vented super is the inner cover, which provides a top entrance in case the bottom entrance gets obstructed. Then comes a moisture board and a piece of foam insulation. The insulation is meant to keep the inner cover warmer than the outer walls of the hive, thereby directing any condensation to to walls where the bees can use it for water without it posing a significant threat to the cluster. The most recent figures from the Bee Informed Partnership show beekeepers in my state, Missouri, suffered a winter loss of over 23% last year. Just a bit up the road in Iowa, that loss was an astonishing 54%. Meanwhile, my winter loss rate is about 5%. Honestly I don’t expect to lose hives in the winter like most beekeepers do (though it does happen every now and then). 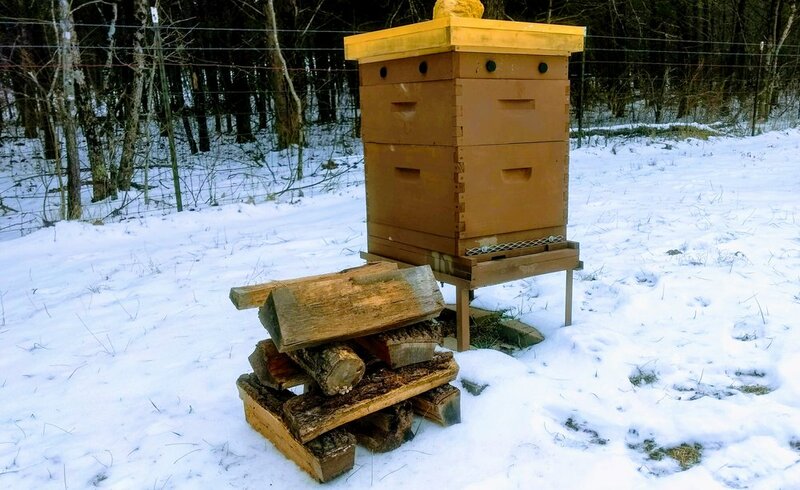 While I have little doubt that mite management plays the biggest role in winter survival, I do believe my winter hive setup—with its attention on controlling moisture—plays some role in my overwintering success. If I’m proven wrong by myself or others, rest assured I’ll change my ways, because my goal isn’t to be right about this; it’s to have each colony flying come spring. Goldenrod: Flower of Last Resort? Of all the flowers in the United States, goldenrod is probably the second-most spoken of by beekeepers (the first is clover). But the funny thing is it usually goes untouched by bees. Or at least by my bees. I have goldenrod blooming here from August through October, and I check it often for foragers. It’s the soldier beetle I see dominating the goldenrod, covering the plants in a moving mass of feeding and mating through mid-September. Bees, on the other hand, are hard to find on the yellow flowers for most of their bloom period. It’s not until late September that I start seeing honey bees on goldenrod, suggesting it’s a little-desired flower for honey bees in my area. Only when there’s not much else to forage does goldenrod becomes a menu option. I’m not disparaging goldenrod. On the contrary, I’m grateful it’s available so late into the year; but it hasn’t been the panacea for fall honey harvests or winter food stores often touted by magazines, websites, and presentations at beekeeping clubs. Are Wild Bees Healthier Than Kept Bees? It's not uncommon to hear beekeepers lament the fact that we have such a hard time keeping our bees alive while wild colonies (more accurately feral colonies) get along just fine without any human intervention. The "proof" for this is typically a tree they've seen housing the same bee colony for years--or even decades. This leads us to speculate that by constantly meddling with our bees, they don't have a chance to develop a natural resistance to pests and disease, namely varroa mites. There is probably some truth to the improved survival rates of feral colonies, but bee researcher Tom Seeley has mostly attributed this to the high rates of swarming in feral hives compared to domesticated stock. It makes sense that a feral hive will outlive an untreated domesticated hive if it's getting frequent brood breaks from swarming. Brood breaks help control varroa by taking away their ability to reproduce inside capped brood cells. We beekeepers generally take measures to limit swarming, because--while it's good for varroa control--it's not good for honey production and we essentially lose half a colony each time it happens. I took the above picture at a nearby nature reserve. I've seen bees flying in and out of this tree for the last few years. But today there were no bees. They had either perished or absconded. The odds are they were overwhelmed by varroa mites. (There are other possible explanations--the best one I can think of is they swarmed and the virgin queen failed to successfully mate.) But that's not really the point. The point is that this tree will probably be reoccupied by a swarm of bees in the spring. And people who visit this park will swear that the tree has been continuously occupied by bees for as long as they can remember. After all, the tree had bees two years ago, and last year, and now it's still got bees. Unless you monitor the tree very closely and very often, you'll have the impression that it's the same colony in there, year after year after year. And so is born the myth that wild bees have magically developed resistance to varroa mites. While in fact, wild honey bees are often just swarms from a nearby beekeeper. Their lifestyle (i.e. frequent swarming) may give them an edge, but genetically the bees are just as susceptible to diseases and pests as the bees in our apiaries. The illusion of their pest resistance shouldn't be used as an excuse to neglect the health of bees in our own yards. In my part of Missouri, the average daytime humidity during the first 20 days of July was 95%. Not only does this make a bee veil pretty uncomfortable, but it also makes it hard for our bees to dry their honey to the same degree as a colony in Arizona, where the average humidity this month has been closer to 40%. This is because honey is hygroscopic, which means it readily absorbs moisture from the air. Colonies deal with this by extracting water while they're transfering nectar from bee-to-bee, fanning the nectar once it's in open cells, and then capping those cells with wax once the honey is sufficiently dehumidified. The resulting low moisture content and protective wax are a couple factors that give honey its superpower of being able to last indefinitely without spoiling. Honey is particularly vulnerable to absorbing moisture while it's being processed (hygroscopic rehydration). At this point we've taken it from the bees, who have been working so diligently to remove water. We're also cutting away the protective wax cappings. During this phase I'm checking my moisture levels often using a honey refractometer. When I uncap a frame and it measures at 18-19% moisture, I don't have much wiggle room so I need to ensure that number doesn't climb while they honey is exposed to the air. Most of us don't have a dedicated honey house, so one option is to use a "dry room" to control the environment for your supers and honey buckets. 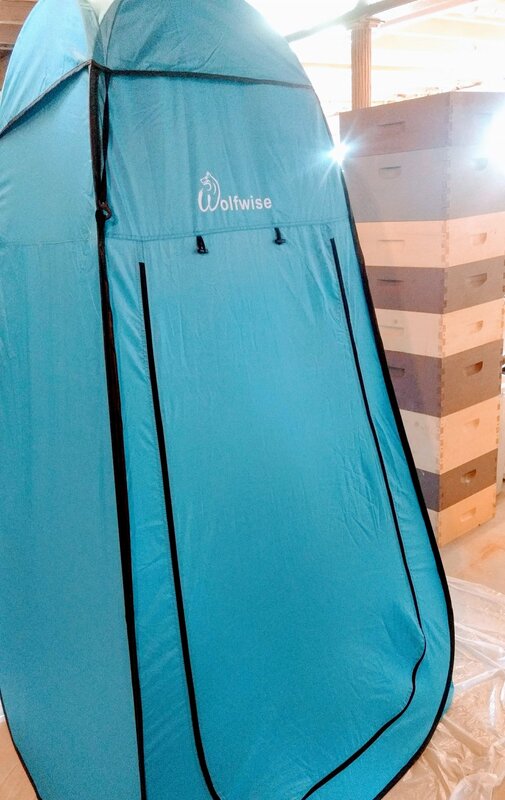 A dehumidifier in one of these little tents can easily create Arizona-like weather and negate the moisture uptake you get during extraction and bottling; potentially being the difference between honey that lasts 2000 years and honey that ferments next spring. My bees will never produce honey that rivals the moisture levels enjoyed by beekeepers in dryer areas. This is perfectly fine because I love our honey, and wouldn't want to change it. Frankly, when I hear of a local beekeeper selling honey at 15% moisture content, I'm curious (suspicious) about how they managed such a low number in such a humid environment. But if you're like me and want to offer raw honey with minimal manipulation, check your moisture levels to ensure they're below 18.5% and keep your processing area dry to minimize water uptake.